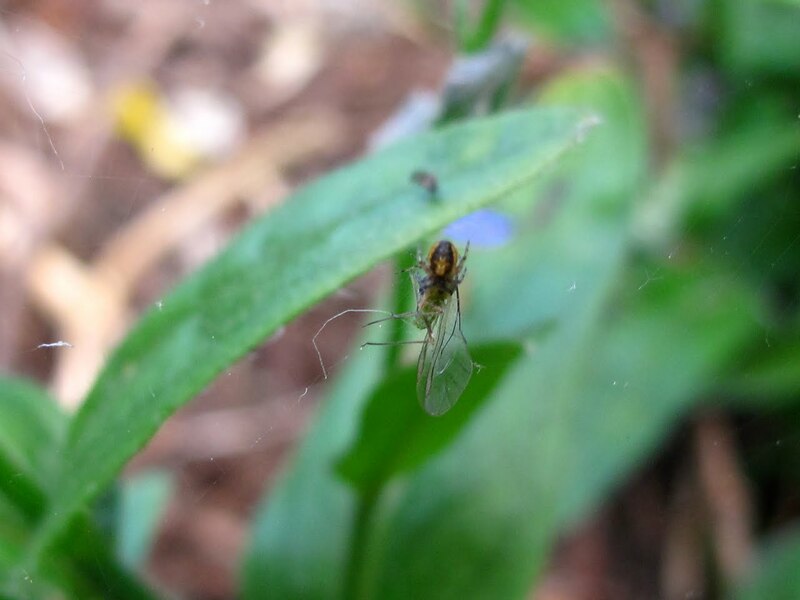 Twenty-six species of plants were attacked by 25 species of aphid which were parasitized by 18 species of primary parasitoids. 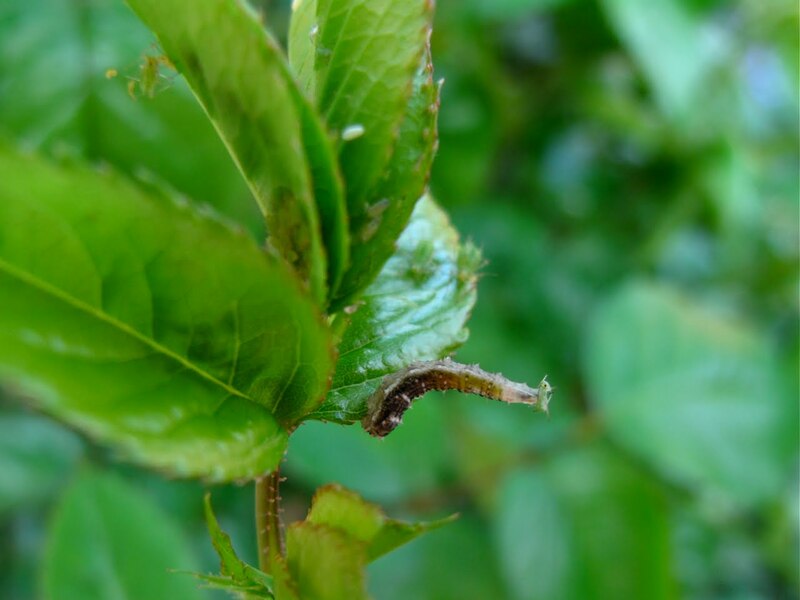 The primary parasitoids were attacked by 28 species of secondary parasitoids, of which 18 directly attacked the still living aphid (hyperparasitoids) and 10 attacked the aphid after mummification (mummy parasitoids). The aphids were attended by three species of ants. Only the bean aphid (Aphis favae) is parasitized (or superparasitized) by no less than 12 species of small wasps which lay single eggs inside individual aphids. Some of the wasps, the secondary parasitoids, lay eggs in parasitized aphids. Then the sweet sap produced by aphids is enjoyed by ants, butterflies and bumblebees. 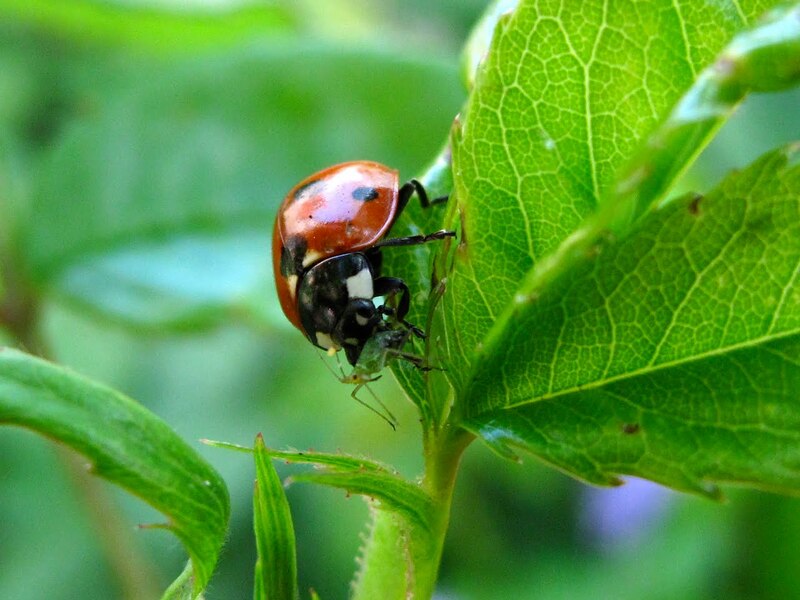 Aphids are eaten by lacewings, ladybirds, hoverflies and small spiders; and swifts and swallows who pick them in the air plankton. You could say that the presence of aphids generates a lot of added biodiversity. This figure taken from the study mentioned earlier summarised the parasitoid network over two years of monthly study. 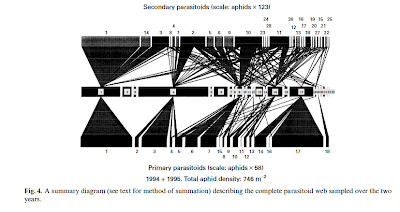 The middle bar represents the different aphid species (each is a number and the length of each section represents the abundance of each species. The bottom bar are the primary parasitoids and the top bar the secondary parasitoids. The conecting lines represent the strength of the interaction between a particular pair of species. Back at the garden, on the roses newly growing shoot, covered on rose aphids (Macrosiphum rosae) this was beautifully illustrated. A hoverfly larvae crawling around also eating them. This one seems to be showing off! A weeks old garden spider has caught a winged one. A parasitic wasp lurking about in the rose bush. I cannot say it is an aphid parasitoid for sure, but keep surveying the rose leaves, leaving and coming back to another leaf. There are lots of fascinating things about aphids and they surely will come back to these pages in the future. To me the last pic looks like a species of sawfly (Symphyta), as indicated by the lack of 'wasp waist' and not many antennal segments. Thank you Norwegica. I should have checked. I have seen others looking more like wasps than this one I must admit. Is is a potential predator? "Is is a potential predator?" Only to it's food plant, and this one may be associated with roses. Try googling 'rose sawfly' ! Why are common bumblebees common?